It’s just on dawn and we are walking the Ridge Fire Trail when a Glider lands on the trunk of a Tallowwood Eucalyptus microcorys right beside the track. For a few magic moments we share the morning light with this curious creature. After watching us for a few moments it disappears up the tree. 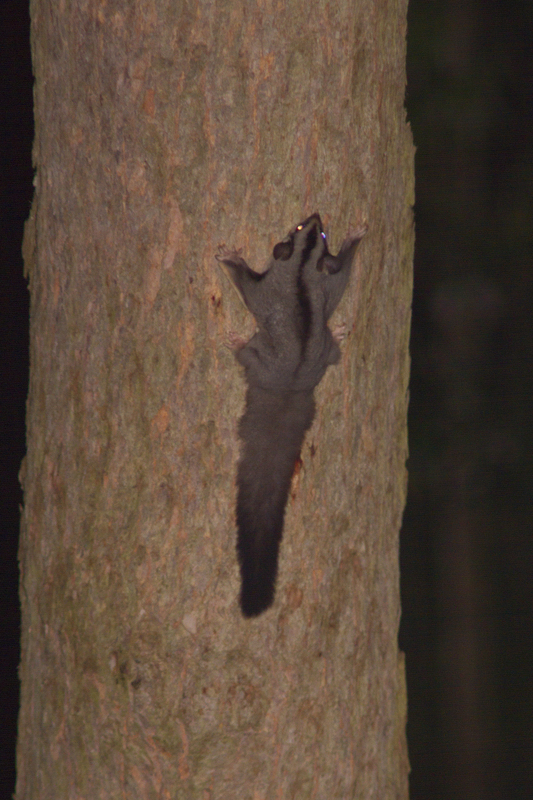 Squirrel Gliders Petaurus norfolcensis are out at night, and may be seen just after dawn, particularly between June and January when they are looking for mates. .
Squirrel Gliders live in groups including one or two adult males, females and any joeys (young Gliders). Gliders can live up to 6 years: typically 3 to 5 years. Squirrel Glider feed on nectar, pollen, Acacia gum and Eucalypt sap, invertebrates and honeydew (a sugary coating on leaves made by scale insects). Surprisingly Gliders sometimes raid birds nests to eat chicks and eggs. Squirrel Gliders typically have a home range of 3 to 5 hectares which is starting to include the Fire Fly and Fox Gully wildlife corridors. Domestic and feral cats: Please keep your cats inside at night when Gliders are active. .
As part of restoration work at the Fox Gully Bushcare site BCC Habitat Brisbane have provided ten nest-boxes for hollow-dwelling species including Gliders. 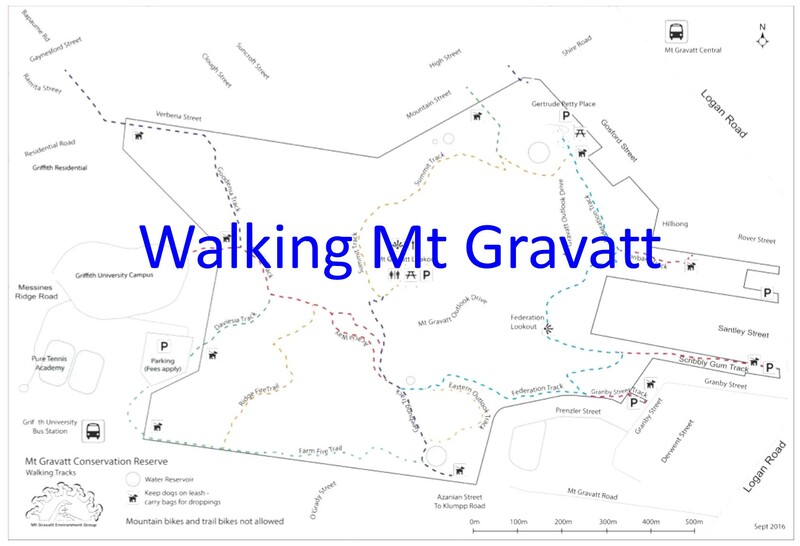 Up till the 1893 Mt Gravatt Conservation Reserve was a railway timber reserve. 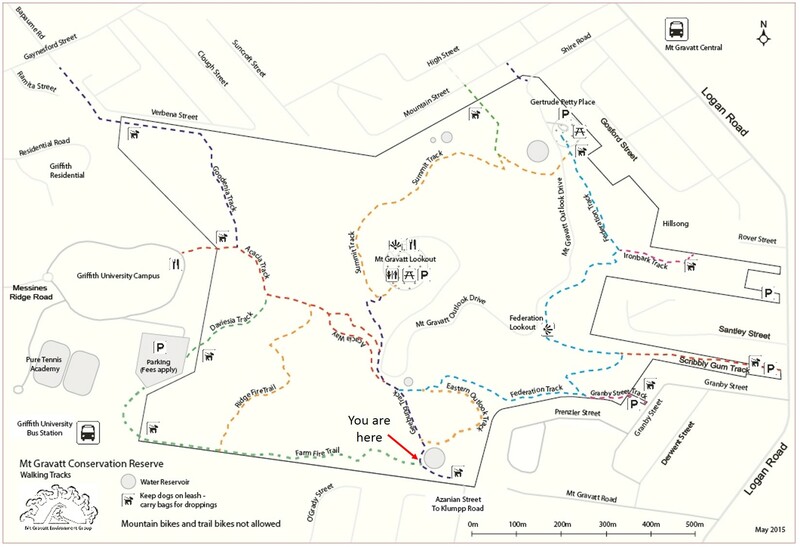 A 2011 survey of the 2ha of Fox Gully Bushcare reflects this history with only thirty-six trees older than 100 years and only five old enough to have a 50% chance of having nest hollows: Fox Gully Research – Tree Hollows – March 2011. A healthy SE Queensland forest habitat would typically have 10 hollow bearing trees per hectare with 2.2 hollows per tree. October 2012: Hollow Log Homes installed ten nest boxes. 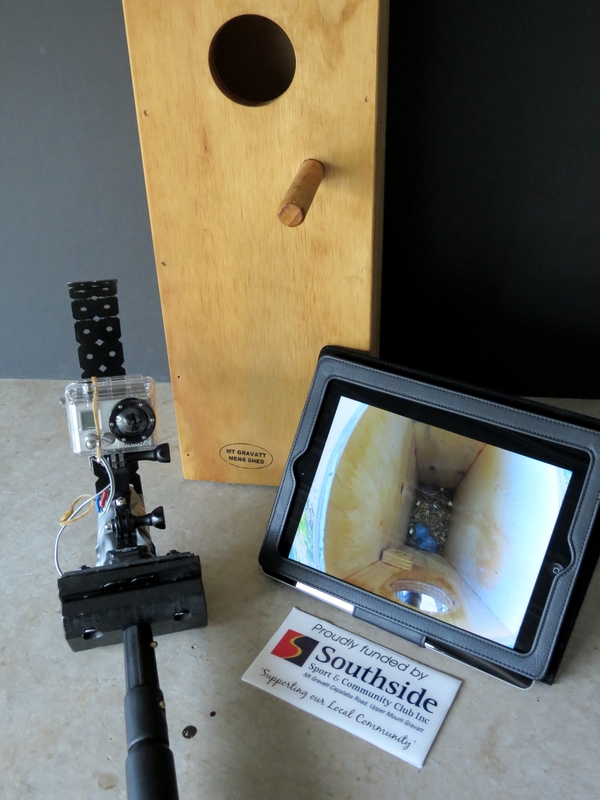 The installation included four boxes designed for Squirrel and Sugar Gliders. The small entry holes allow entry for Gliders while excluding Possums and most birds. 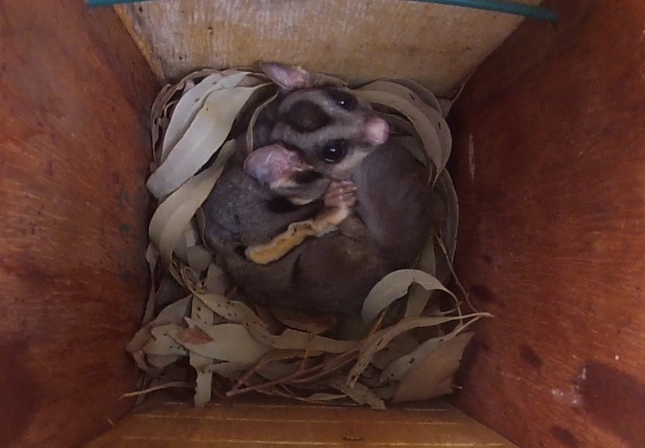 Just over one year, success: three Glider boxes are occupied and Kookaburras are raising chicks in the Boobook Owl box. The Hollow Log Homes Next Box Audit show 80% of nest boxes are being used with Gliders now occupying six boxes with at least two families..
Nest boxes are typically mounted 6 to 7 metres off the ground so monitoring is done using a GoPro iPad combination purchased with a Southside Sport & Community Club grant. Infrared wildlife cameras are also used for monitoring Glider boxes as well as Koala and feral Fox activity. The Murray-Darling Association site features an excellent video about their Squirrel Glider Local Area Management Plan (LAMP). The second half of the video has video of the gliders in action … legs spread, sailing between trees.